Performance Time: Approximately 60 minutes, 58 pgs. COMEDY. When Beauty’s father gets laid off from his job at K-Mart, he ventures into a nearby forest to collect wood. 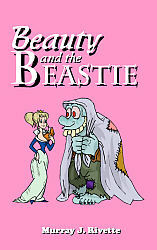 But the forest is owned by a horrendously ugly guy named Beastie?and boy is he ugly! Beastie demands that Beauty’s father send one of his three daughters to live with him so that he has someone to play cards, ping-pong, Monopoly, Boggle, pool, tennis, golf, croquet, and Parcheesi with. But when Beauty’s two selfish older sisters, Blabbette and Ermatroid, refuse to go, Beauty eagerly volunteers. At first, Beastie is delighted to have Beauty join him at the castle, but his gaming dreams are soon dashed when he discovers that Beauty would rather read Harry Potter books than play games! Can Beastie be happy playing tag by himself? A veteran actor and director who has participated in more than 200 theatre productions, Murray J. Rivette has worked with actors William Shatner, Betty Grable, Sam Levene, Vivian Blaine and Christopher Reeve. He has taught improv classes at the Little Palm Family Theatre in Boca Raton, FL, and is the author of several children’s plays based on classic fairytales. Rivette lives in Valdosta, Georgia.